Established in the year 2000, We “CHANDRAN STEELS” have come out as one of the leading organizations engaged in manufacturing and supplying a wide range of Commercial Kitchen Equipments for Hotels & Restaurants. The products offered by us are pizza oven, office cabinet, wall cabinet, stainless steel six seater dining table and stainless steel gas bhatti. In addition, we offer cabinet, laundry trolley, floor bin, onion potato bin, stainless steel freezer and machinery items. These products are highly acclaimed for their sturdy construction, corrosion & abrasion resistance and durability. Empowering upon our skilled & experienced professionals and sophisticated infrastructure, we are able to successfully meet the ever-changing requirements of the clients. Our professionals make relentless attempts to ensure that the products manufactured by us are flawless and conform to the international quality standards. We also regularly monitor our production process to keep these at par with the latest advancements in the markets. Owing to our modern techniques of production, we are able to minimize the production cost and offer the finished products at a competitive price. 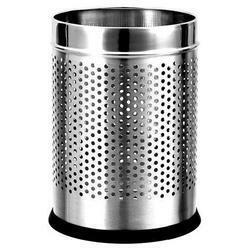 “our perforated bins are used as waste basket for dry waste like papers and office waste & also used as laundry hamper for soiled clothes the perforations all around ensure the clothes shall not smell foul. Available in various sizes, can be used with or without standard garbage bags. Common rooms, bathrooms bedrooms, soho, under the desk. It is commonly used in offices, living areas and inside the rooms. It is made of stainless steel and beautifully finished, available in various sizes, can be used with or without standard garbage bags. Common rooms, bathrooms, bedrooms, soho, under the desk are common usage areas. Product material: stainless steel 201 grade dimensions.